Lake Bled isn’t very large, and a perimeter walk around it only takes an hour or two. Not only does it make for a nice walk, you get to scout out a good spot to chill later as well as taking photos of the lake from all angles. Score! If you are short on time, then cycling around might be a better option, though it can be quite a dodge-fest on the southern shore of the Lake as the path is more narrow. Bled Castle is the oldest castle in Slovenia, perched on a cliff on the northern shore of Lake Bled overlooking the entire region. The path that goes up the castle from the town isn’t particularly difficult and the view alone is worth the ticket price. If you are interested in the history of Bled, they also have a comprehensive exhibition on. There is even a souvenir shop selling metal work as well as a restaurant where you can eat and admire the surroundings. The Bled Castle – the oldest in Slovenia! 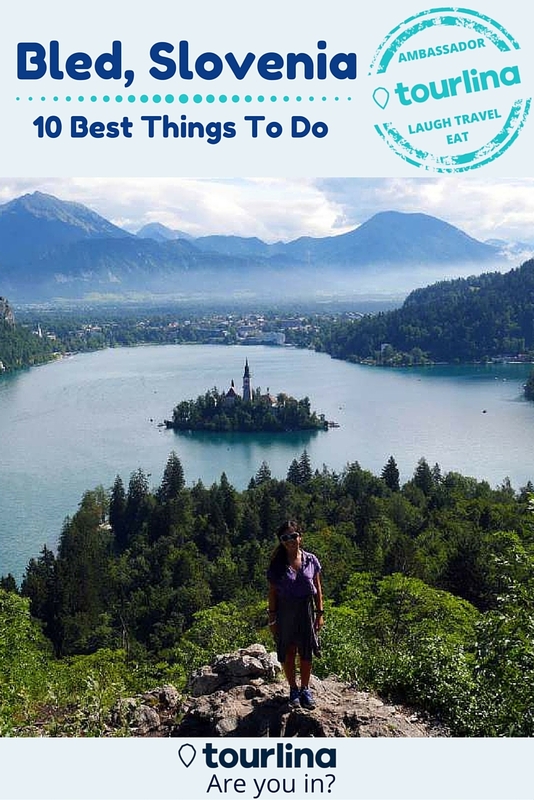 If you want to see the Lake Bled on postcards, then a hike up Ojstrica is the answer.Even though there are plenty of best viewpoints of Lake Bled, this is the classic one and the trail itself is not too difficult to navigate. However, the grounds can get slippery after rain, therefore it’s best to be careful and wear appropriate footwear to go up. 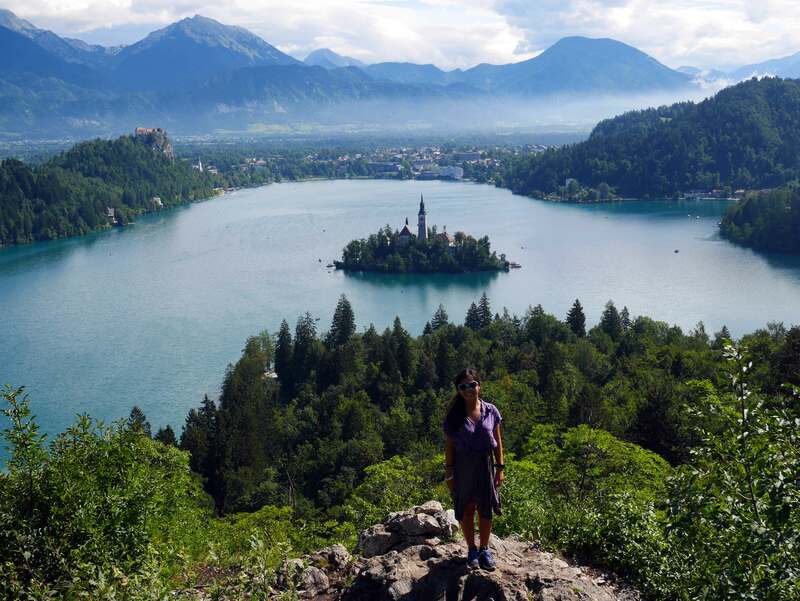 The best time to visit is in the morning before everyone else arrives – and the trail can be found near the camping ground southwest of the shore of Lake Bled. 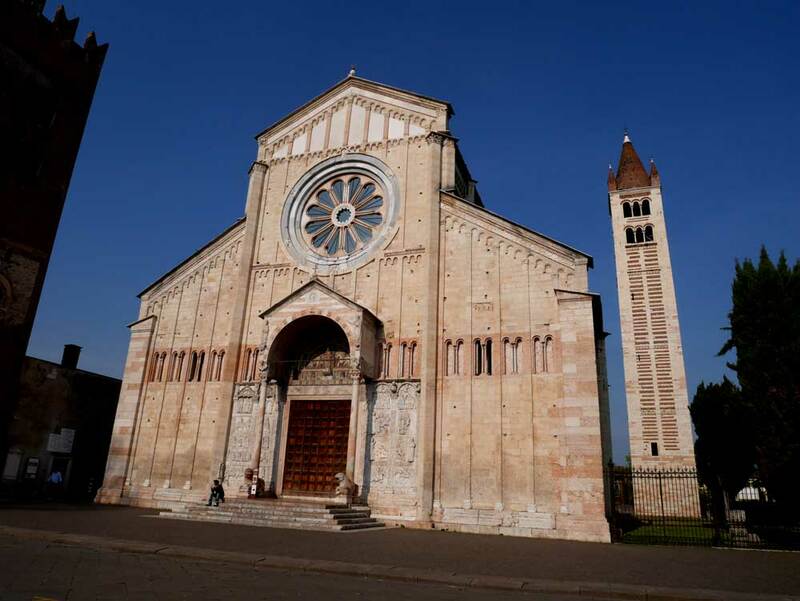 A pilgrimage place for many around the region since the Renaissance time, the major attraction on the island is the 17th century Assumption of Mary Church. Its bell tower can be seen from the shore and the 99 steps that lead up to the church adds to the medieval charm. The best way to get there is to rent a boat and row across. You can, of course, get ferried across on one of the many manned plenta on the east shore, but it’s more romantic and fun to row across yourself. 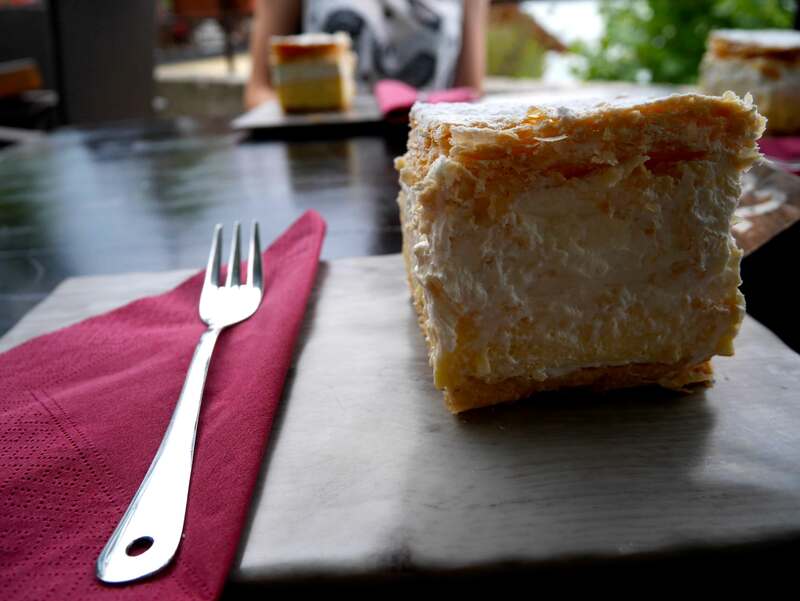 Despite not knowing that Bled is famous for the cream cake, almost every restaurant serves them and you’d be hard pressed not to try one. My favourite restaurant in Bled is Grajska Plaza right by the shore of Lake Bled – right under the looming Bled Castle and in front of the swimming masses. There are plenty of tours available in Bled that you can book via the hostels. One of them is Canyoning. If you are not familiar with what it is, Canyoning involves walking, swimming, abseiling and jumping your way down a stream – with licensed guides, of course. It’s a great way to see the countryside as well as getting that rush of adrenaline and ticking it off your bucket list. To be honest, the main reason why I did it was because it rained nonstop for three days while I was there, but it turned out to be the best decision I made. 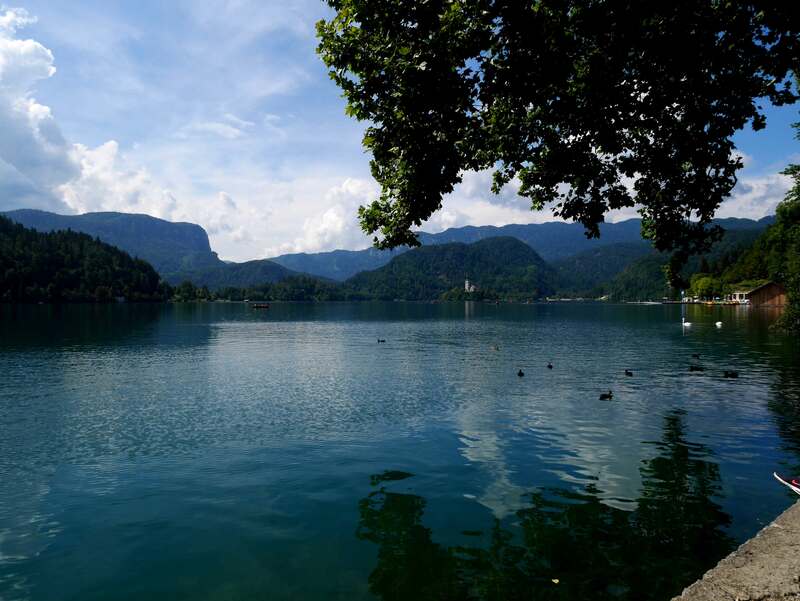 The ski slopes in the winter and the tobboganing hill in the summer, you can get on the car lift in the southern shore of Lake Bled all year around to get a panoramic view of the lake. Tobboagning is a strangely exhilarating activity and one of Bled’s unique attractions. It involves getting on a small cart and accelerating your way down the slope along the meandering metal tube. 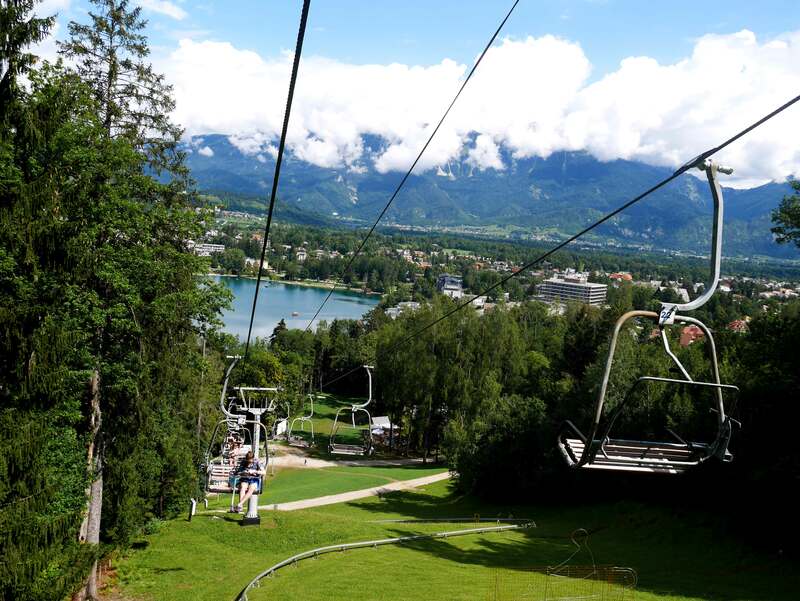 The kids love it, the adults secretly enjoy it – it’s probably more popular than rowing to Bled Island. 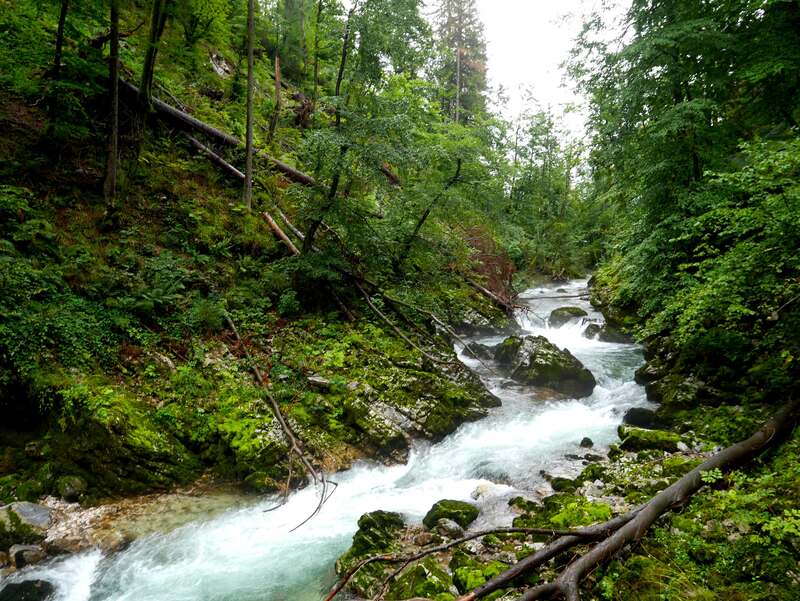 Only a few kilometers from Bled is the Vintgar Gorge, famous for the canyons cut through by the Radovna River. A wooden trail will take you through the most scenic part ending at the 13 meter high Sum Fall, and the hike is beautiful even in the rain. 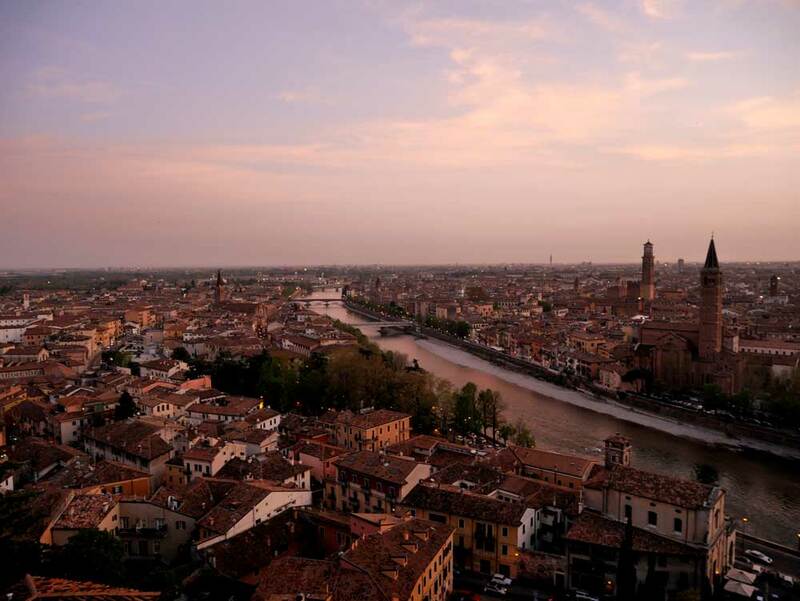 You can easily walk or cycle there, though many hostels offer a free shuttle service to and from. Lake Bled isn’t the only lake around town. 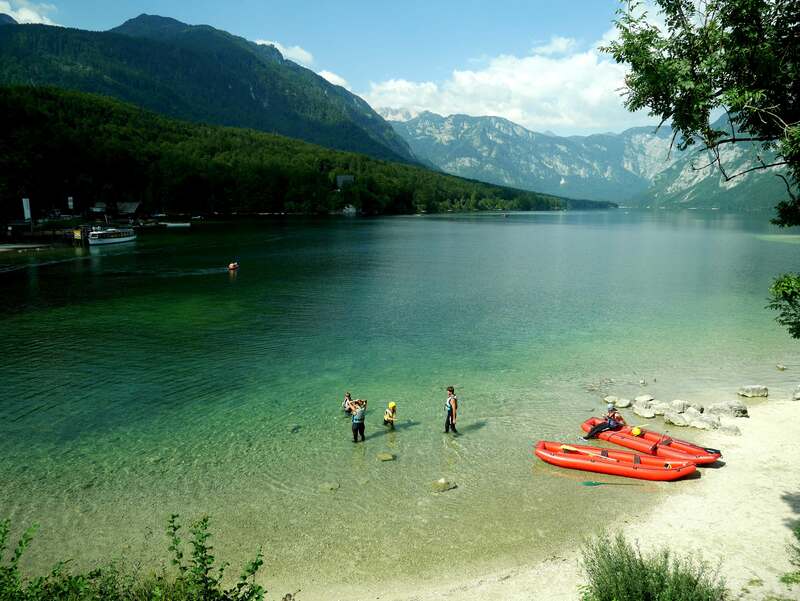 Lake Bohinj is the largest permanent lake in Slovenia and rests in the Triglav National Park only a half hour bus ride from Bled. It makes for a good day trip if you have time to spare, and the water there is even colder than Lake Bled if you fancy a swim. There are also plenty to do around Bohinj as well, such as the Savica waterfall, Mostnica Gorge and Mount Vogel – and I fully recommend spending a few days there as well if you can. The capital of Slovenia is not far from Bled either. Buses run frequently between the two cities and the journey is under an hour. 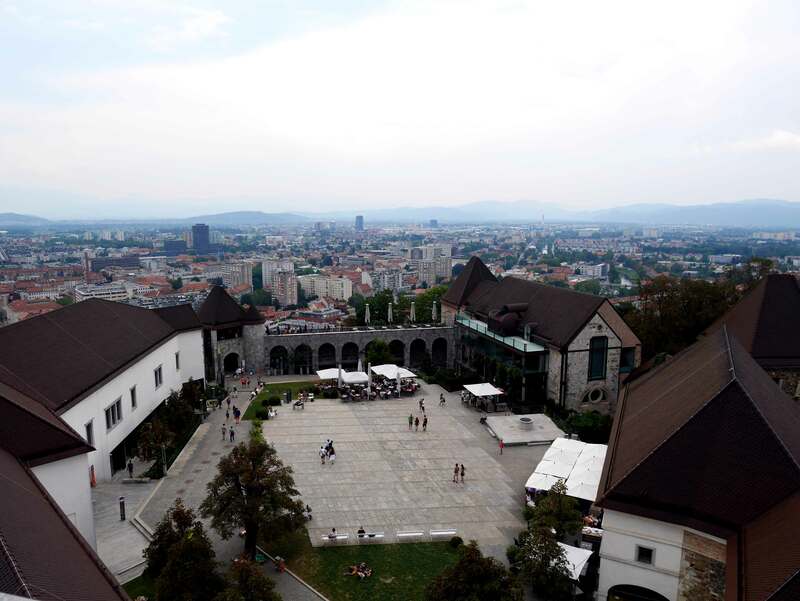 Ljubljana is a small capital that can be done in a day. 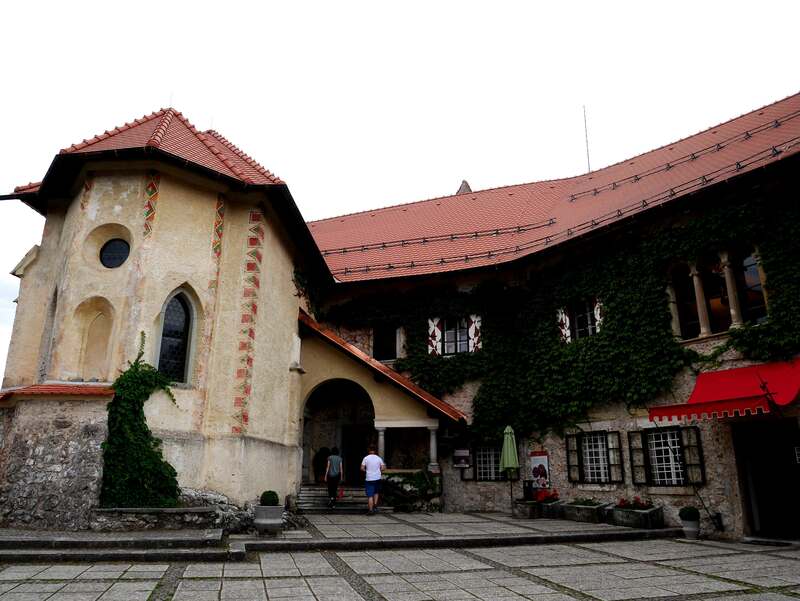 You have the eccentric Metelkova and the historic castle, as well as the Ljubljanica River and the old town charm. 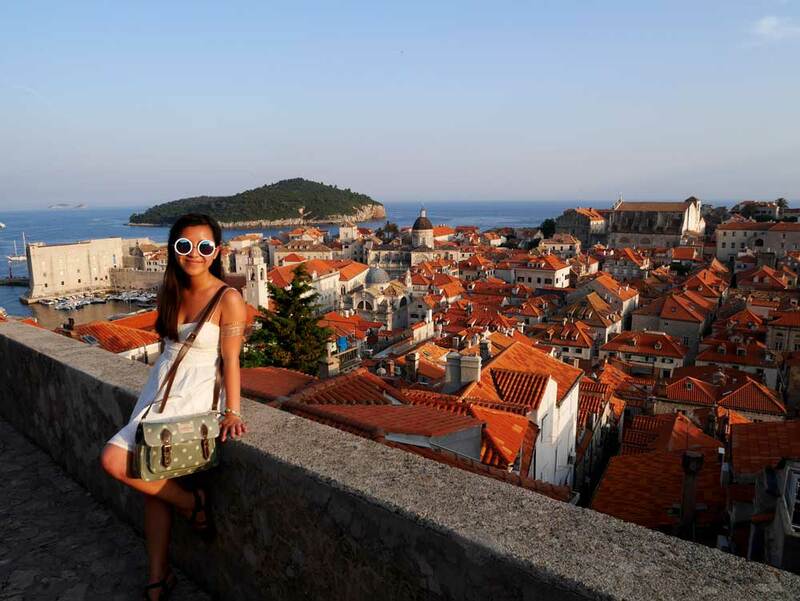 Take a chic photo with Dubrovnik as backdrop! Dubrovnik is one of the prettiest cities I have ever visited, with its gray stone walls and orange tile roof. 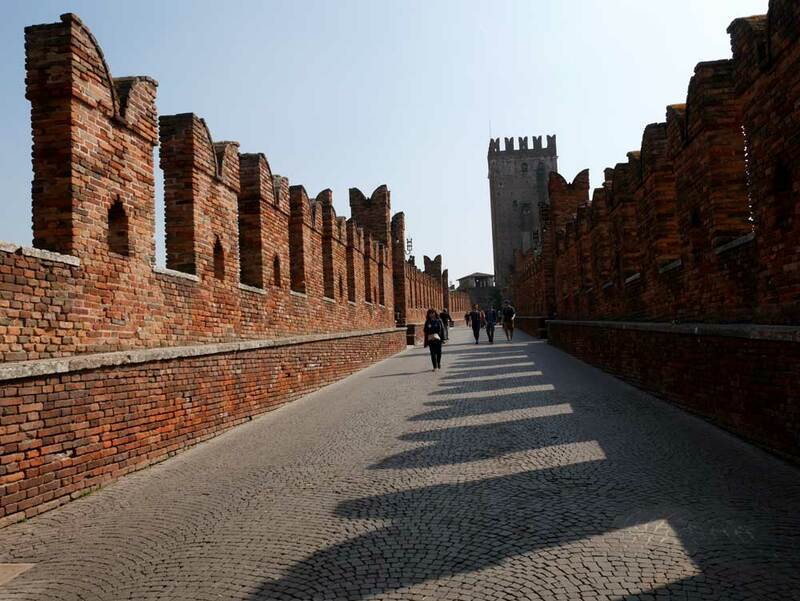 There is no better way to admire this medieval city than walking along its stone walls. 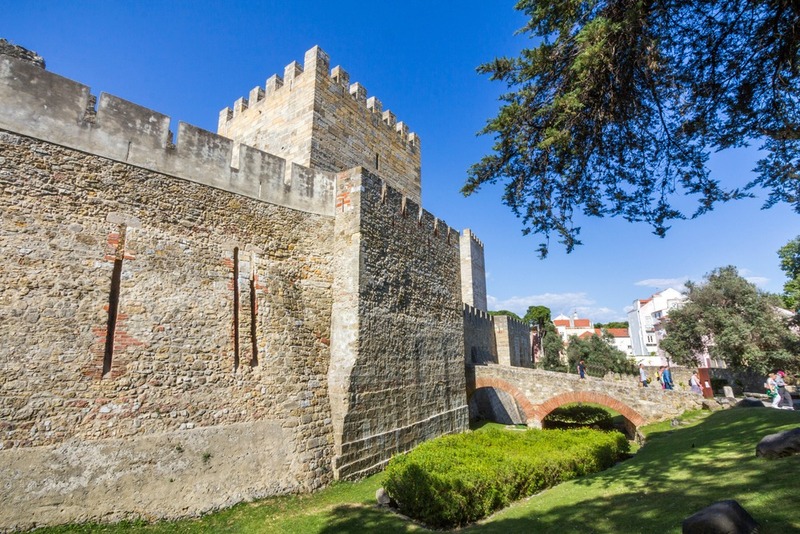 The origin of these stone walls came from the fact that the city did not have an army, and the walls are their only protective measure against invasion. The wall extends over a whopping 1,940 meters, and gives you an unparalleled view of the entire city and the Adriatic Sea. 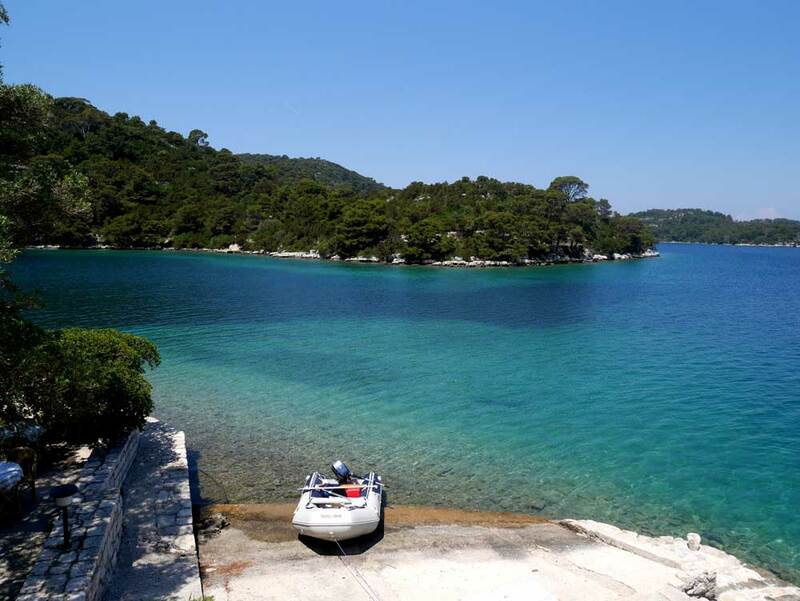 Mljet is an island situated in the waters between Split and Dubrovnik. Almost the entire island is part of the national park, it consists of two lagoons linked via a small canal to each other and the sea, and the best way to get around is to cycle around it. We spent a whole day in this park, seeking out secluded spots to swim in and soaking up the gorgeous sceneries. 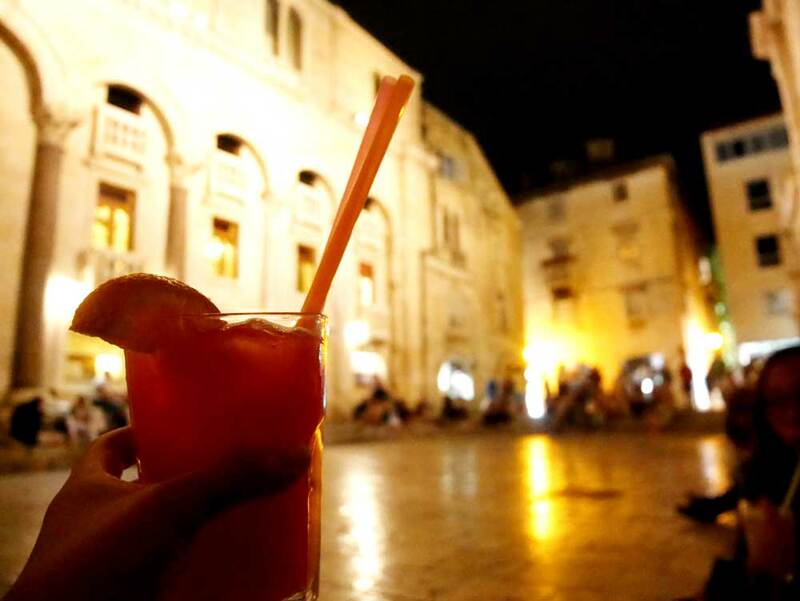 Ok, so it doesn’t have to be Sangria, but have a drink under the Paristyle in Diocletian Palace in the evening sipping a drink while you listen to the live music is definitely a different kind of experience. It’s not every day you get to sit on the doorstep of a former Roman Empire’s Palace with strangers and sway along to some classic tunes. 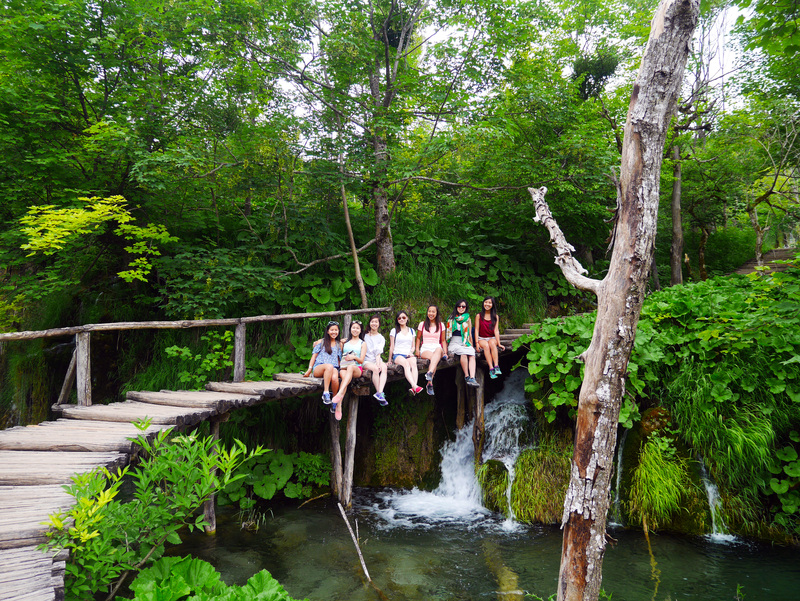 Girls’ day out from Split! Split is the center from which many Croatian islands can be reached, and there is no limit to where you can go for a day trip from there. You have the gorgeous Brac with its vast expanse of sand, the more secluded Bisevo and the famous blue cave as well as Hvar and its old town. 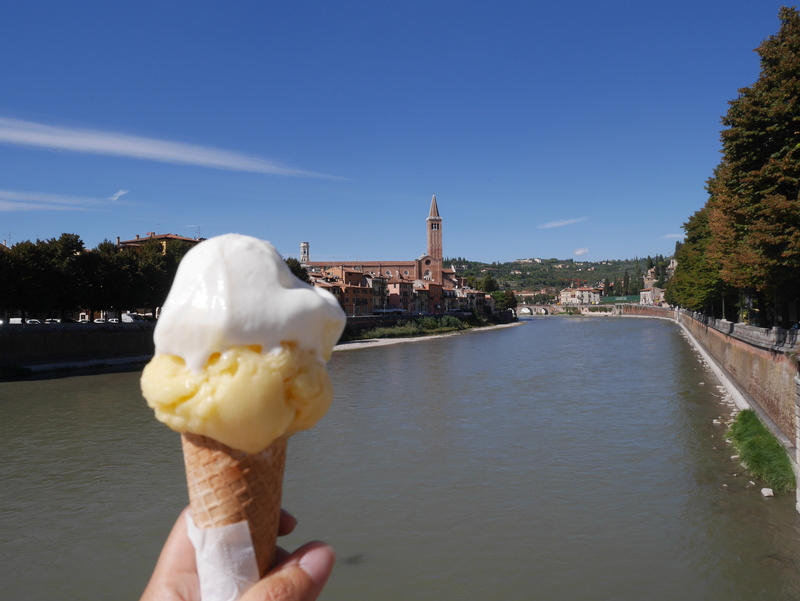 In fact, you can hit a lot of famous locales if you find the right tour! 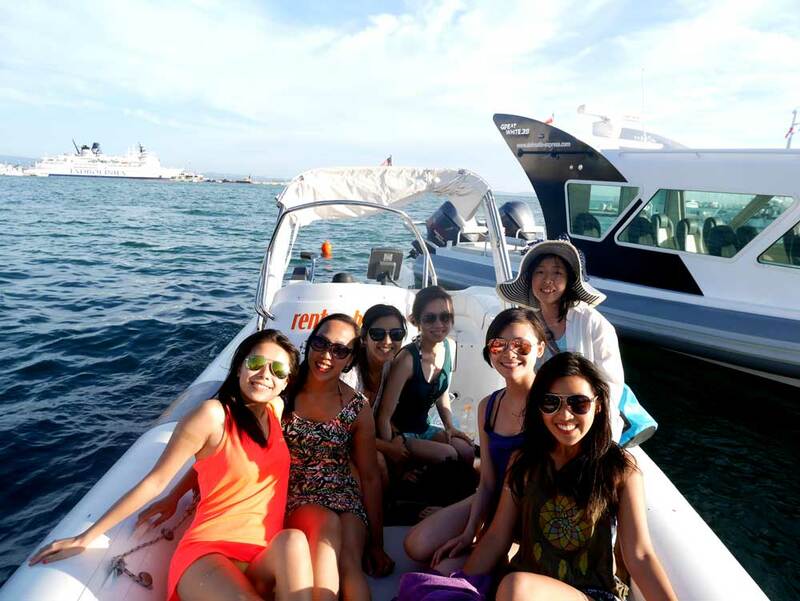 We ended up going on the best ultimate boat trip from Split on a speed boat that got three days’ worth of tangles in our hair and an unforgettable day. Hvar is but one of the many islands you can visit from Split, and its name is mostly made from being the party island around the region. 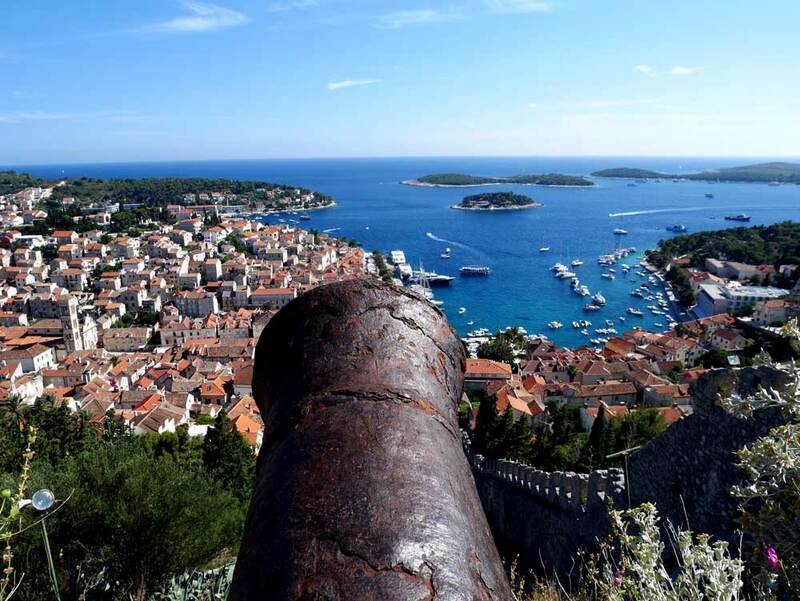 However, Hvar is not short of history to tell as well; the Spanish Fort at Hvar Town was built in the 16th century against the Spanish, and while the Fort lacks exhibitions and decoration, its view of the city more than made up for anything else. There are cannons dotted around the fort along the walls, and we couldn’t resist climbing onto one for fun! 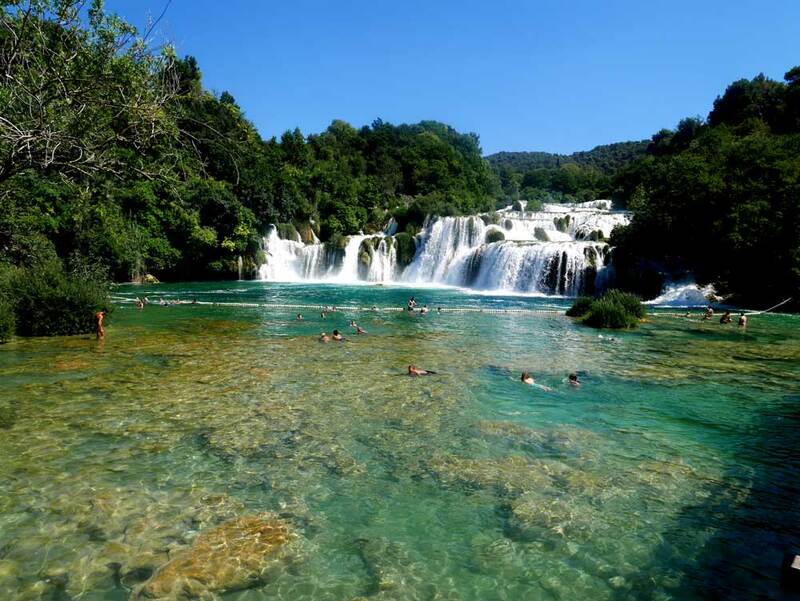 While most people are obsessed with Plitvice National Park, the memory of swimming in the Skardiskin waterfall in Krka National Park remains fonder in my mind than visiting the former. With equally beautiful colours contrasting with the gleaming yellow limestone platform, it’s hard to resist taking a dip even though swimming against the current from the waterfall is no easy feat! Even though I do prefer the time I spent at Krka National Park, there’s no question that Plitvice is out of this world. My experience was slightly dampened by the bad weather, but even in the rain, Plitvice National Park’s beauty is unrivalled. With 16 lakes and several carefully planned routes for you to choose from, you can easily find the path that would make the most out of your schedule. 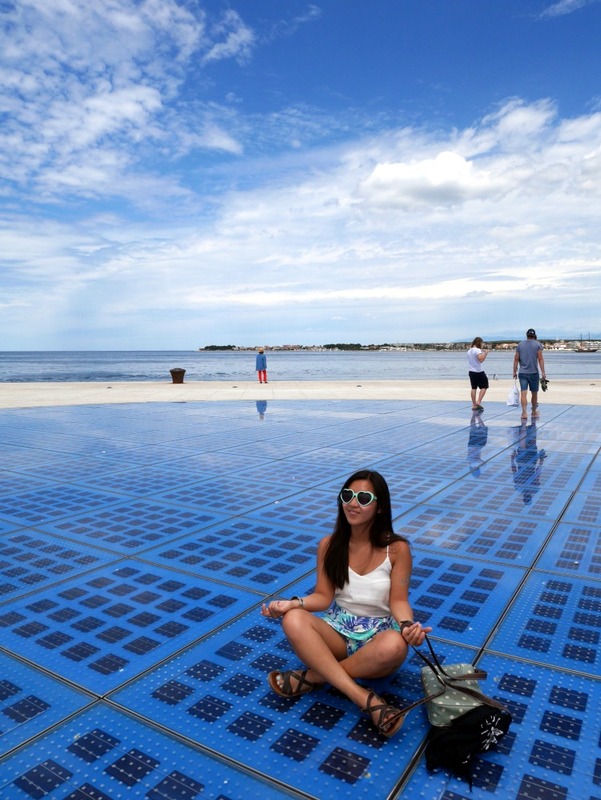 While the Roman ruins in Zadar had been fascinating, it was the Sun Salutation that drew me to visit this city. It is a modern installation by a local architect as part of the effort to transform the sea front that was heavily damaged during WWII. 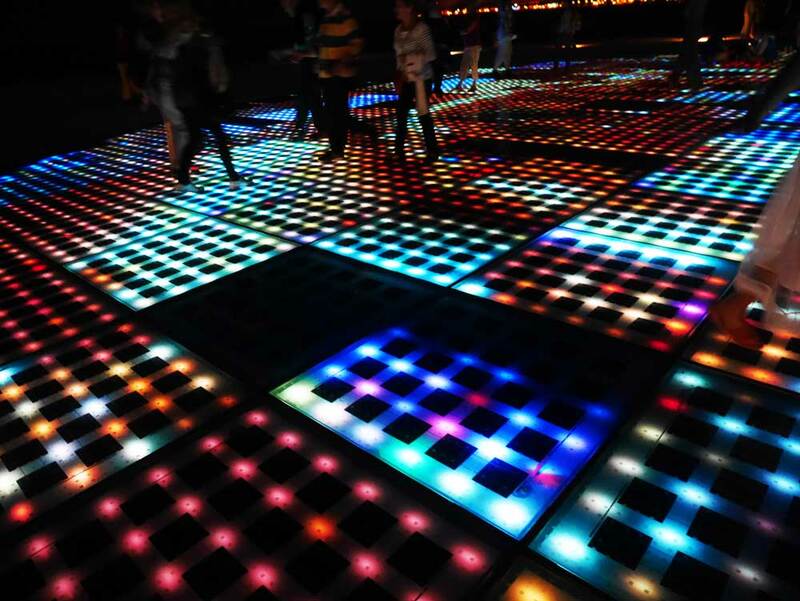 During the day, it’s nothing more than a circular expanse of bright blue tiles; but at night, the tiles came to life with the solar powers they absorbed throughout the day and ignite in techno-colours. 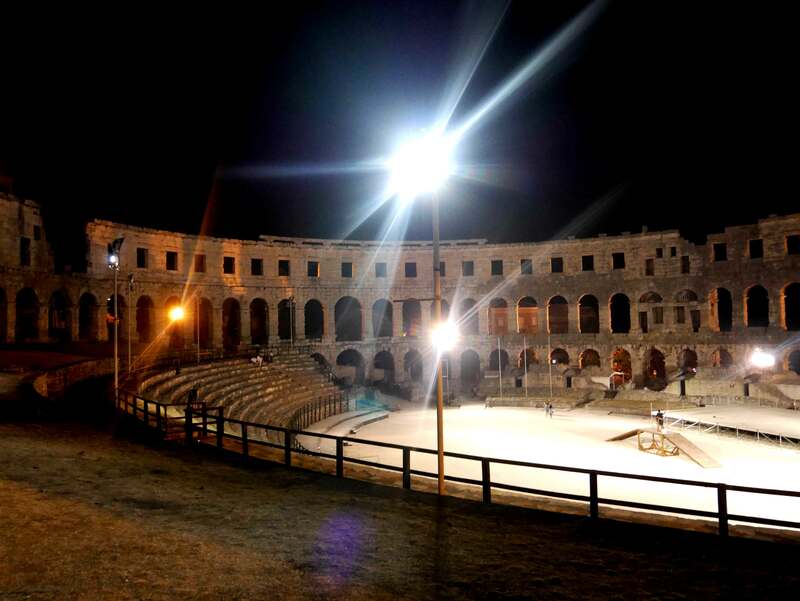 One of the largest remaining Roman Amphitheaters around the world, the Pula Arena might not be as well preserved as the one in Verona, it is still an impressive sight facing the sea. 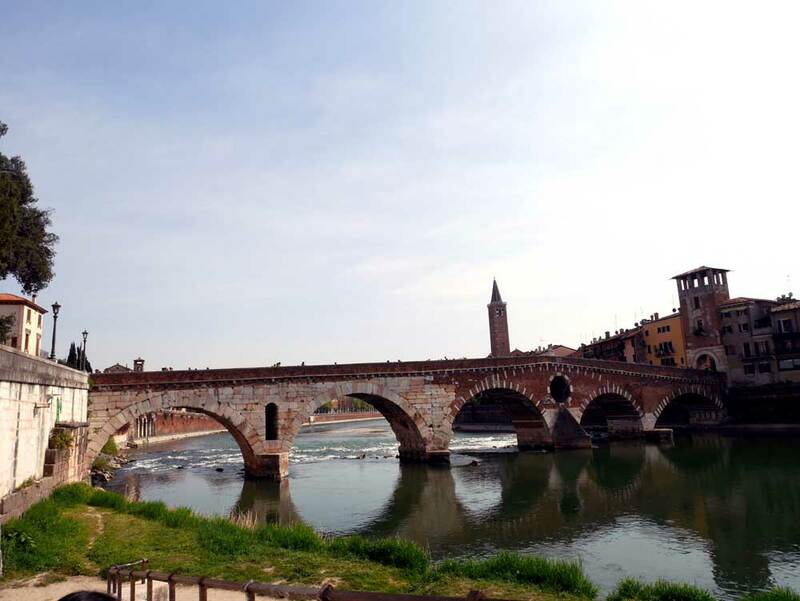 Built in the 1st century AD, it is almost two thousand years old! And it makes for some stunning photo opportunities. 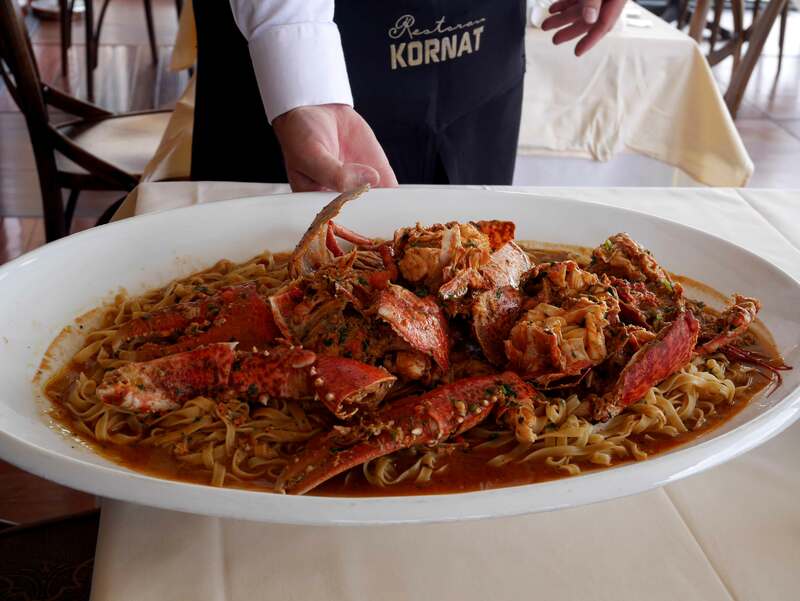 Being a country that is near the sea, seafood is without a doubt on the menu of every restaurant in cities along the coast. Put on the affordable price tag and I can guarantee that you wouldn’t even want to leave the country. Tuna steak, mussels, calamari – my mouth waters just thinking about the amazing food that I had. 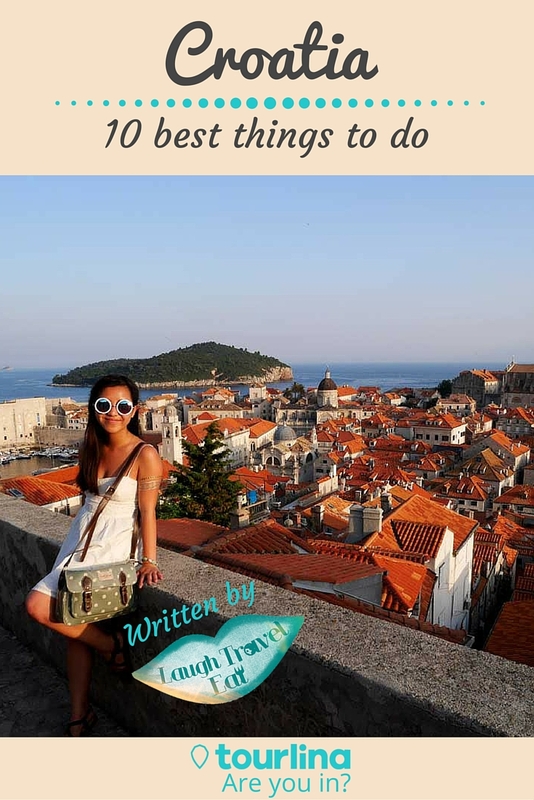 If you are interested in more about Croatia or any of the activities above – I have written more about Croatia in my own blog Laugh Travel Eat. Visit my Croatia archive for more information. As is often the case with capital cities, Dublin has a certain reputation that has cemented over time. It’s one of friendly local pubs, lively Irish music and of course, Guinness Guinness Guinness. 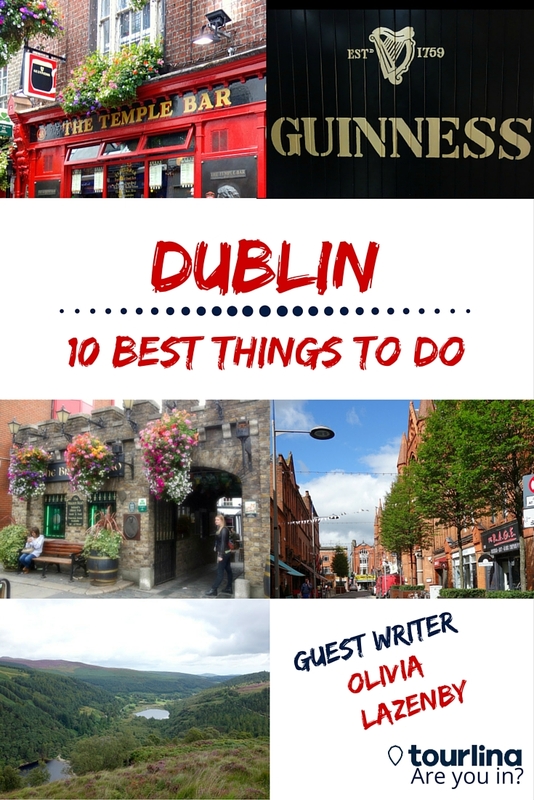 While this reputation is not unfounded – the locals are friendly, the music is lively, and the Guinness is delicious – it is by no means all Dublin has to offer. If you explore a little further in this city, you’ll find iconic modern architecture, hip and edgy districts, stylish cocktail dens, and beautiful wild countryside on the doorstep. 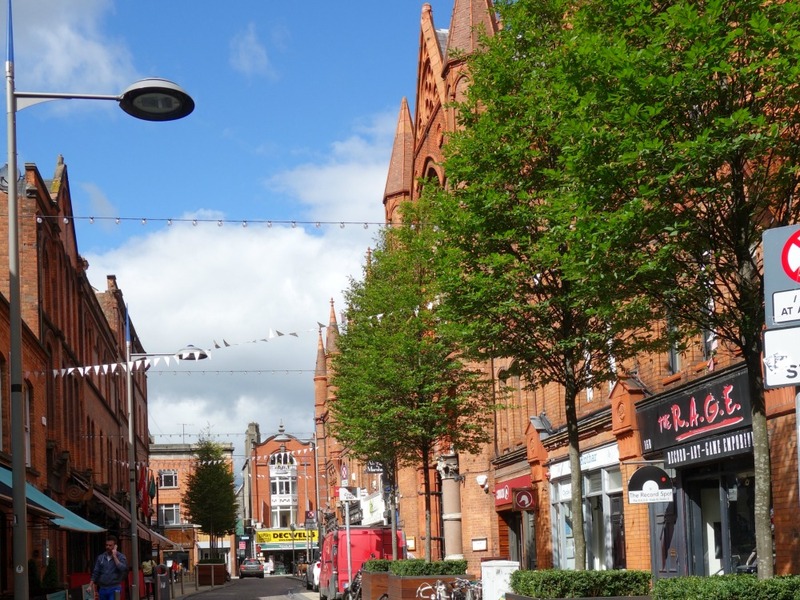 The block stretching from South William Street to George’s and from Lower Stephen’s to Exchequer Street is known as Dublin’s Creative Quarter. With a long-standing history of specialist design, the area is a hub of creativity, boasting artisan boutiques, design studios, cafes and unique arty shops. 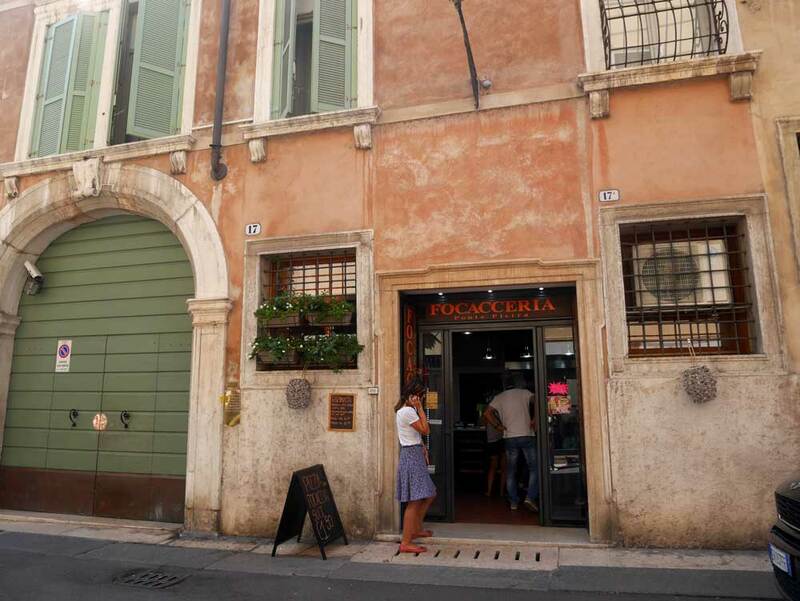 This is a more modern and edgy area of the city, where you will find hip coffee shops spilling out onto the pavements and street art adorning the walls. Be sure to poke your head into George’s Street Arcade – an ornate shopping plaza stuffed with indie clothing boutiques and vintage curios, where you’ll rub shoulders with Dublin’s coolest city-dwellers. If you only do one museum in Dublin, it has to be this one. 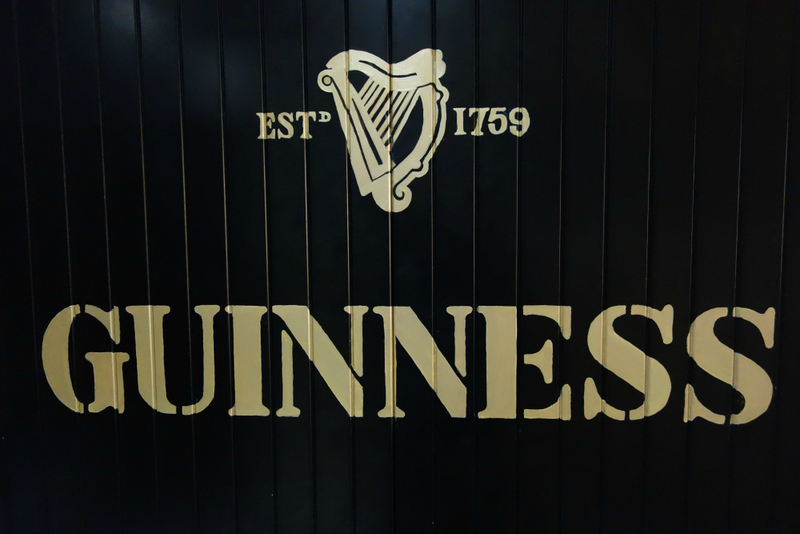 The Guinness Storehouse is more than a museum, it is an experience. Interactive, sensual and immersive, you’ll go on a journey through the history, brewing stages and modern day brand that built Ireland’s most famous drink. Have a lesson in Guinness tasting, try pouring your very own pint, watch some of the best TV adverts, and learn about every stage of the brewing process from harvesting the hops and grain to building the barrels to store the brew in. Once you’ve toured the museum, make your way up to the Gravity Bar to savour your complimentary pint, where you can admire panoramic views over Dublin. 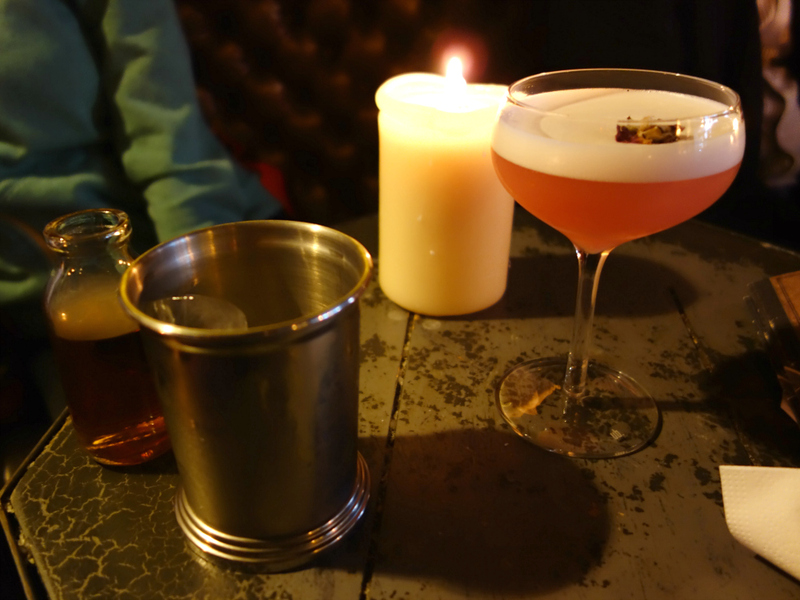 If you’re on the hunt for a particularly special place to wet your whistle, see if you can find Vintage Cocktail Club – or VCC, Dublin’s best kept secret. A hidden bar reminiscent of the Prohibition era, it won’t be easy to find, but it’s well worth the hunt. Every cocktail is deliciously unique, artfully crafted by expert mixologists. The extensive menu takes you through every era in the history of cocktail making, from maritime to the prohibition to present day. The bar itself is lit only by candles and a few sparse lamps, with risqué photos adorning the walls and sumptuous vintage furnishings. You have to book a table in advance and the drinks don’t come cheap, but they’re well worth the extra euros. Dublin sits in the shadow of the dramatic Wicklow Mountains – a must-visit for any outdoors or hiking enthusiast while holidaying in Dublin. Soaring mountains provide stunning panoramic views over tranquil lakes and beautiful wooded areas, and what’s more, this is where the water is sourced to make Guinness. 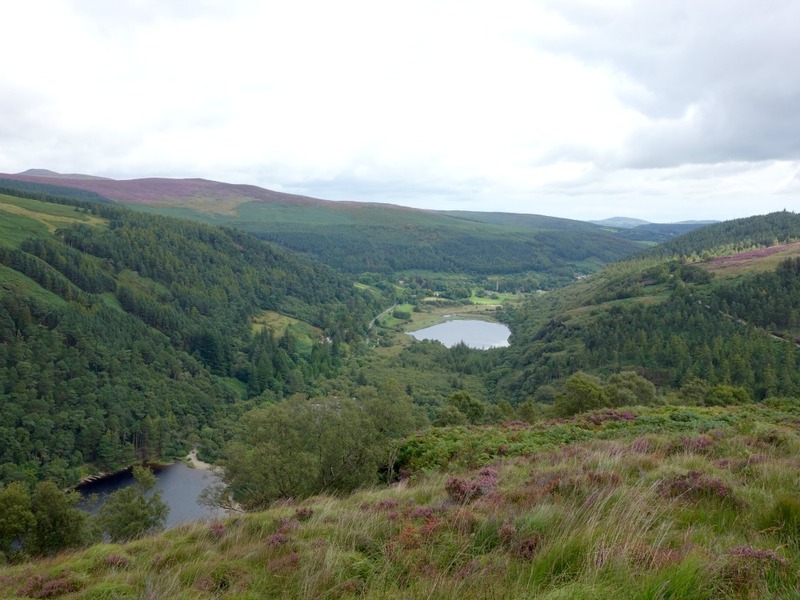 Coaches embark from Dublin every day to Glendalough – a small settlement in the mountainous area. Here you’ll find an ancient monastery and crumbling graveyard in the picturesque valley, and a range of walking routes to suit all abilities which meander through the hillside and loop around the two serene lakes. Located in Dublin’s stunning Docklands, Ely Bar and Brasserie is famed for its enviable wine selection. 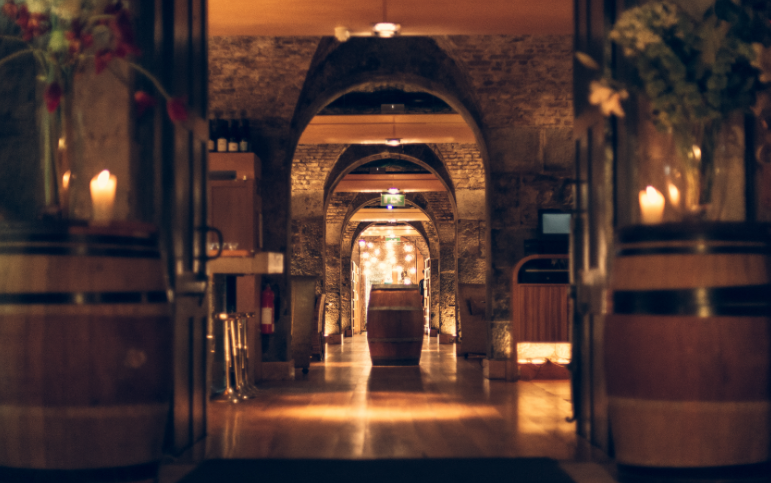 Thematically homed within the beautifully restored 1821 wine vaults, the bar and restaurant boasts over 500 wines by the bottle and 100 by the glass. The intimate, elegant setting is the perfect choice for a special occasion. Fresh and flavoursome Irish food is complemented with the perfect wine, which the friendly staff will be happy to recommend. Organic beef, pork and lamb is sourced locally, and their vegetables are planted seasonally and grown to order. 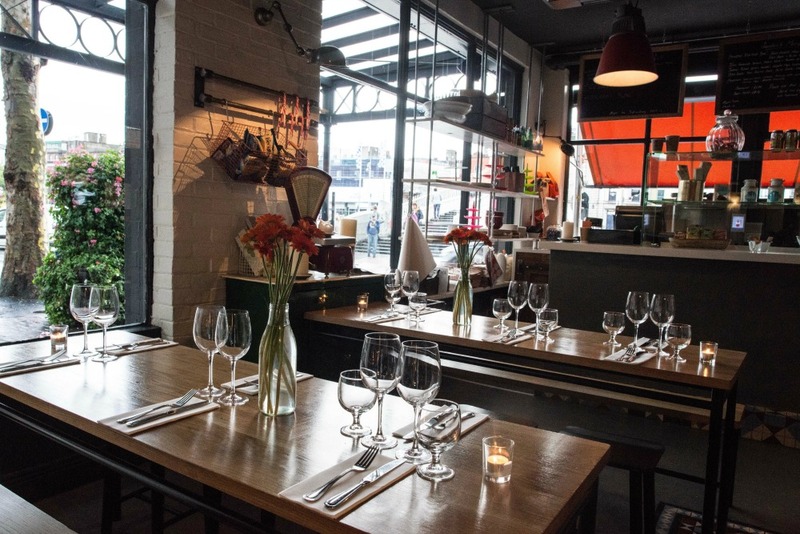 To say Ely revolutionised the wine and wine bar scene in Dublin would be completely true. This newly regenerated post-industrial area is a marvel in landscaping and design. 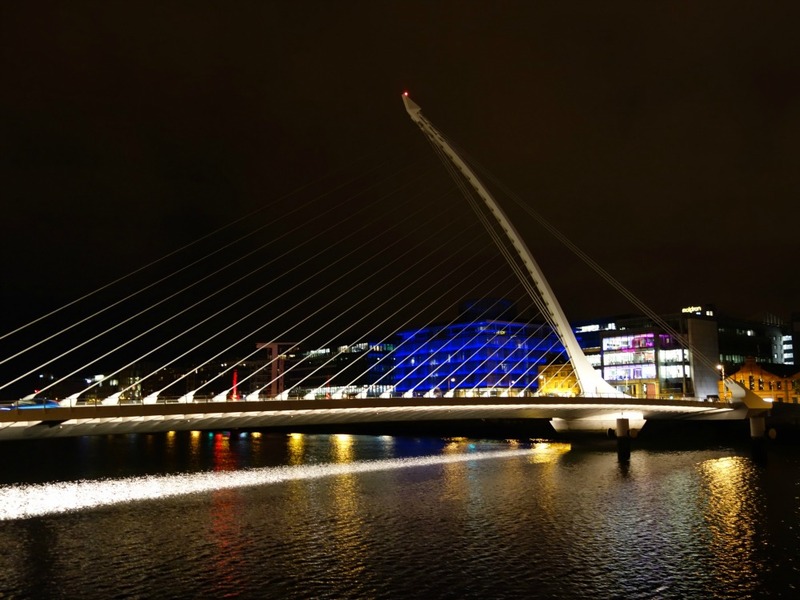 It spans both sides of the River Liffey and features innovative open spaces such as Grand Canal Square, the super-modern Grand Canal Square Theatre building, and the sublime and iconic Samuel Beckett Bridge, which is unmistakeably shaped to resemble a harp – the national symbol for Ireland. Take a walk around the square and admire the modern design of the buildings surrounding it. 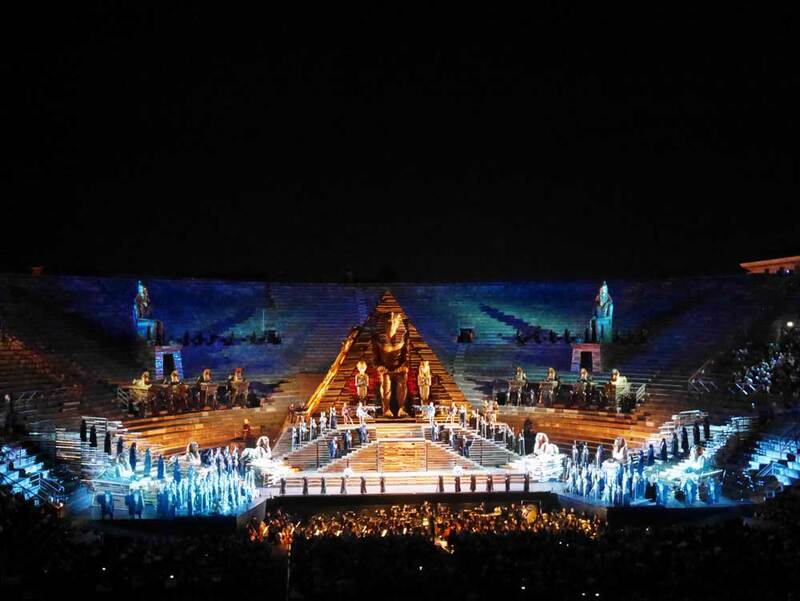 Attend a theatre show, dine in one of the many restaurants, and be sure to admire the view of the bridge at night, when it is softly illuminated to become a timeless piece of architecture. Housed in an historic and iconic building in Dublins history, this is an unpretentious yet incredibly cool eating house. James Joyce himself used to work in the building, so the restaurant has a lot to live up to in terms of Irish heritage, but you won’t be disappointed. Set back from the River Liffey and overlooking Ha’penny Bridge, The Woollen Mills spans four floors, with double aspect windows making the place incredibly light and airy. It’s the perfect spot for a hearty Irish Breakfast, a smooth, rich coffee, or a craft beer or two. If the sun is shining you could even sit outside on the roof terrace and watch the world go by. 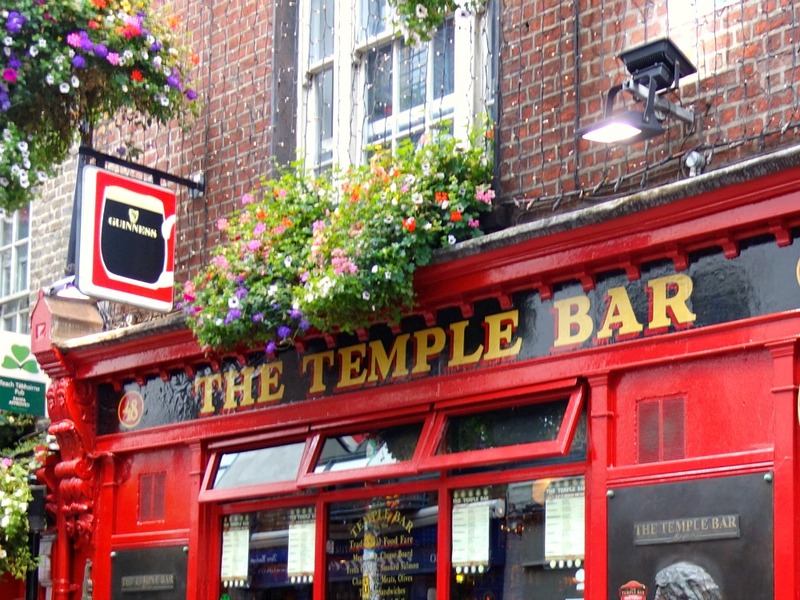 Dublin’s nightlife district is simply teeming with pubs, bars and taverns. No matter what time of the day or night you venture along the lanes, you’re sure to find live music, traditional and contemporary Irish cuisine, a raucous and inclusive atmosphere, and of course Guinness aplenty. Scope out a pub for an Irish breakfast, listen to a live band or dance the night away. Every Saturday Temple Bar Food Market winds through the streets, where you can sample the very best home-grown produce including cheeses, pies, meats, seasonal fruits and vegetables, jams, chutneys and preserves from local vendors. If there’s one thing that can be said about the Irish it’s that they love to make music. 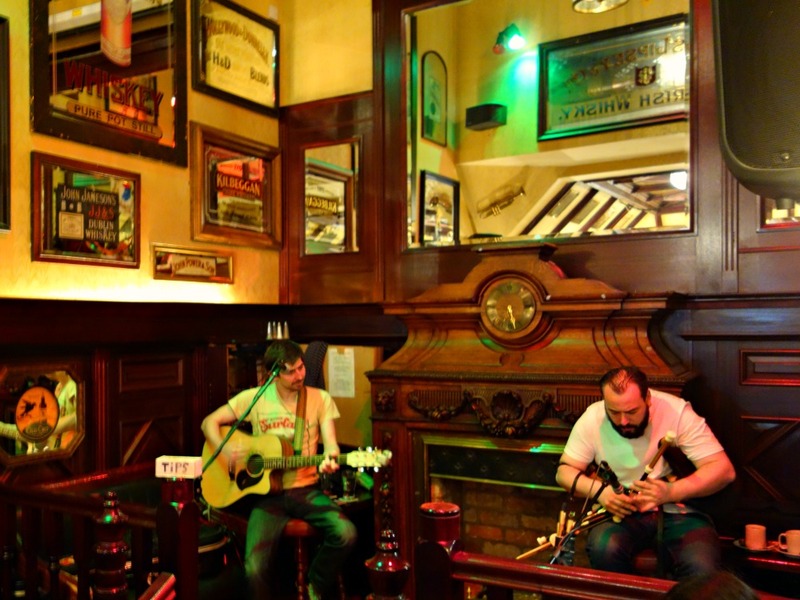 Most pubs and bars in Dublin play host to live music in some form or another. Traditional Irish music is often accompanied by one or several Irish dancers, who are more than happy to encourage the audience to join in and learn a few steps. 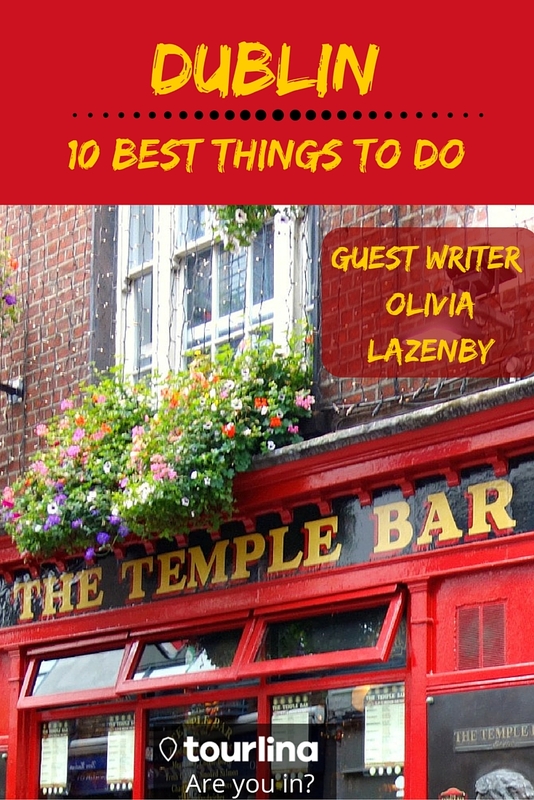 While Temple Bar is an obvious choice to scout for Irish music, the taverns off the beaten track are no less enjoyable. It’s here where you’re more likely to wander in to the middle of a “pub session” – a spontaneous and relaxed musical experience where anyone with an instrument is free to join in the fun. 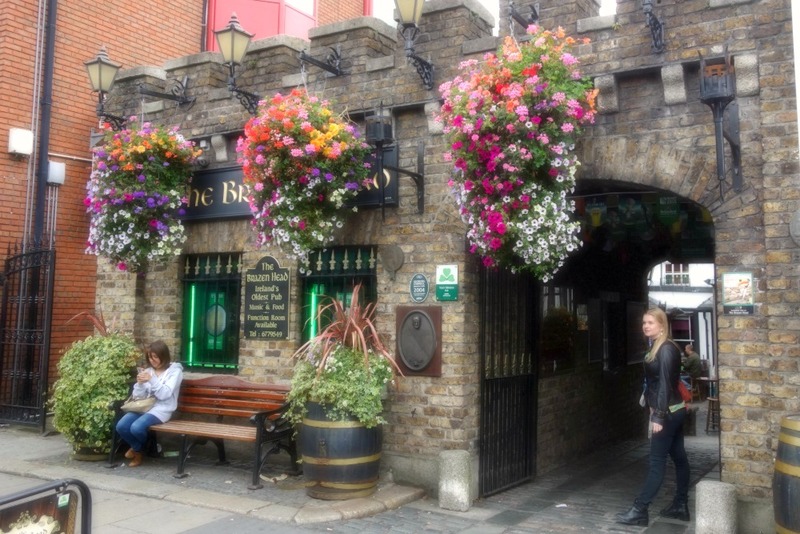 Dublin’s oldest pub is a ramshackle building with sloping floors, low ceiling and aged beams. A wild array of pictures, photographs and adornments cover the walls. It’s a tradition for American visitors to the pub to pin a dollar onto one of the walls with their name and the date they visited, which gives the impression that the whole façade could blow away at any moment. With a lively and welcoming atmosphere and hearty food served with a smile, the Brazen Head is the archetype of Irish pubs. You simply have to sit down and enjoy a freshly poured pint of Guinness. If the weather holds up, make the most of the cobbled courtyard. 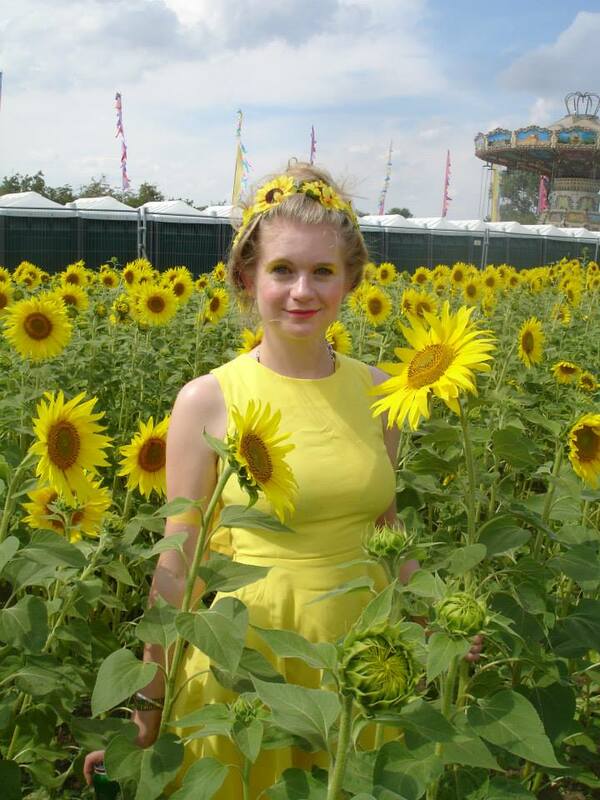 Olivia Lazenby is a travel, sustainability and lifestyle blogger. A northerner from the fringes of Manchester, UK, she has lived in France and Australia as well as Liverpool and Leeds. 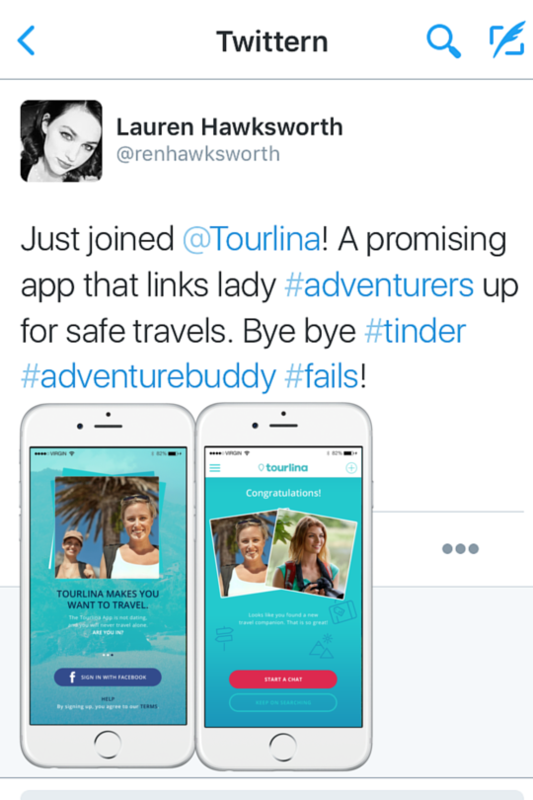 She is currently planning her next adventure to South America. 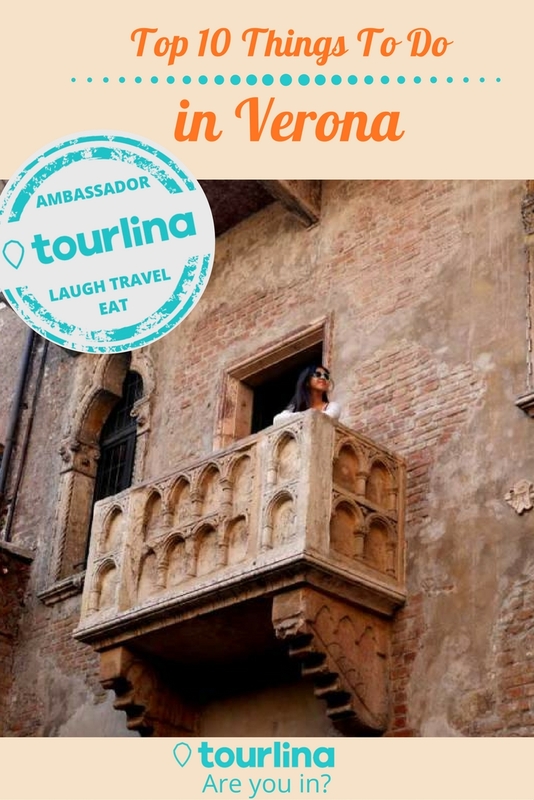 Her favourite things to do while travelling include discovering cocktail bars in new cities, rummaging in second hand shops and flea markets, and climbing to the highest point in the vicinity to admire the views. 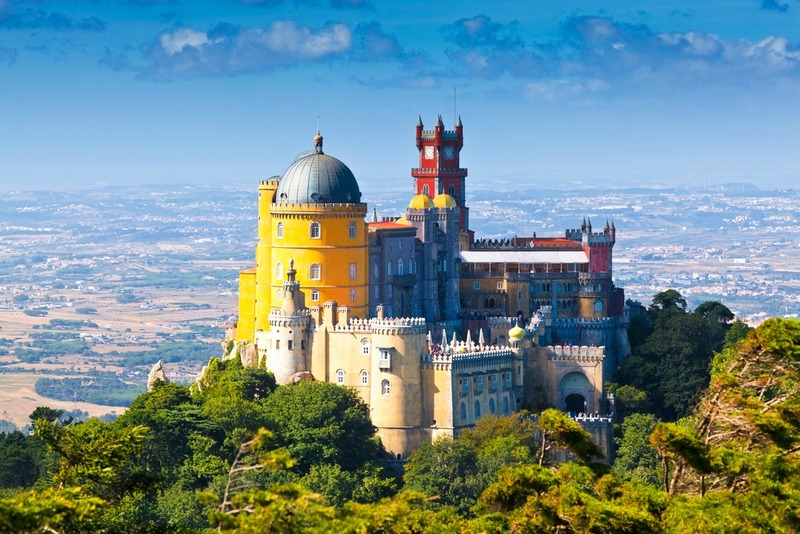 The home of Portuguese royalty, this palace is stunningly unique. As brightly coloured as a fairytale gingerbread house and surrounded by extensive gardens, Palace de Pena will take your breath away. Marigold yellow, burnished terracotta and sky blue sections are topped by turrets, towers and archways and interspersed with impressive carvings and sculptures. Every turn provides a new perspective on the surrounding landscape, and the interior of the palace is just as impressive. 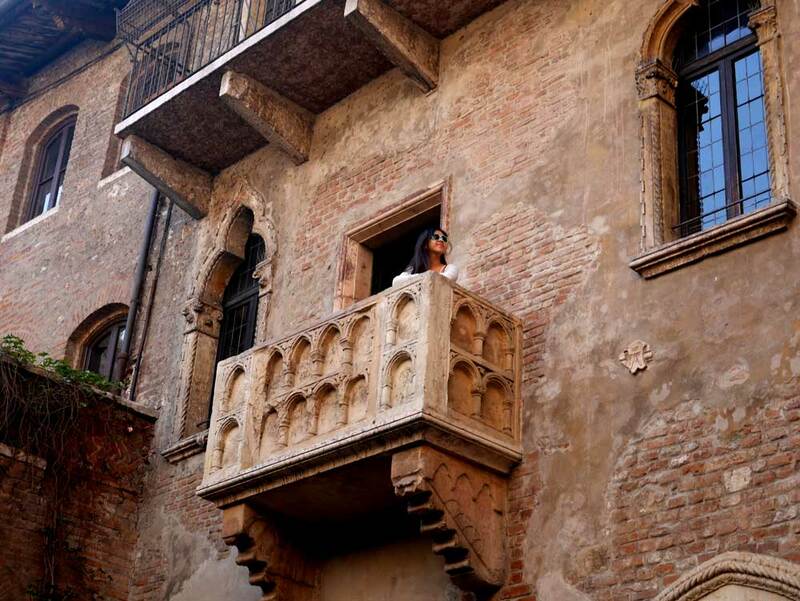 While there are ongoing works to preserve and maintain the structure, this doesn’t distract from its beauty or authenticity. Immerse yourself in a piece of Lisbon’s history and pick up a few bargains while you’re at it. 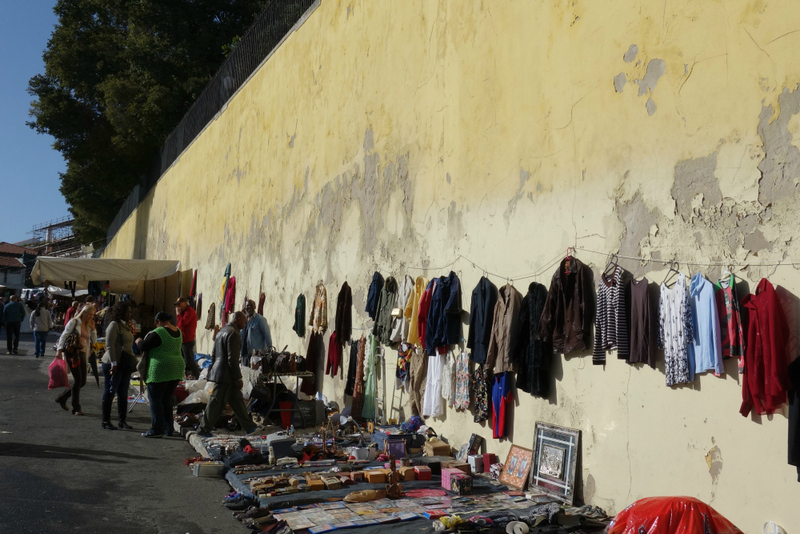 This flea market dates back to the thirteenth century, taking place on Sundays and Tuesdays. The locals here trade in all manner of antiquities and eccentricities, from period collectibles to old clothes and broken electricals. It would seem anyone with a blanket and a few items to sell can set up shop on the square. Don’t be afraid to get stuck in and have a good rummage through the stalls, you never know what you might find! 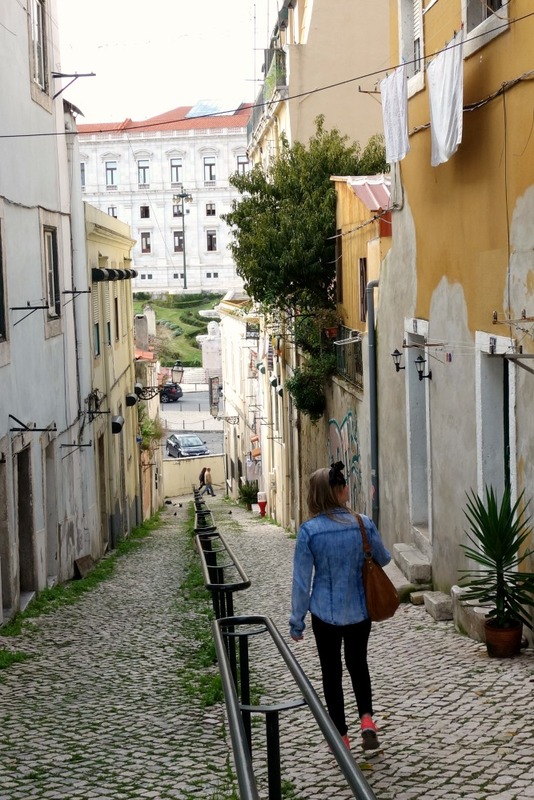 Set, like much of Lisbon, on a steep hillside, Bairro Alto has gained a reputation as the city’s vibrant nightlife quarter. Unassuming and tranquil by day, the steep calcada paved streets come alive by night as the bars open. From live acoustic bands to niche genres of dance music, you can find a bar for any mood if you’re willing to explore. If you’re looking for a more sophisticated evening, try BA Wine Bar. This intimate venue specialises in Portugal’s finest wines. Sample vintages from any region by the glass, with your own attentive specialist to advise and guide you on your journey. 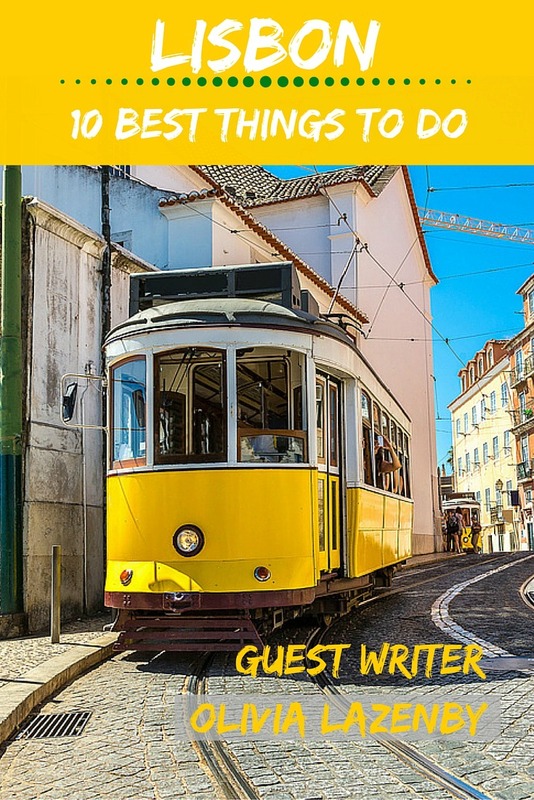 No trip to Lisbon would be complete without a ride on the tram. Trundling through back streets and racing up and down incredibly steep hills at break-neck speed, they offer a unique perspective of this chaotic city which walking or driving simply doesn’t provide. 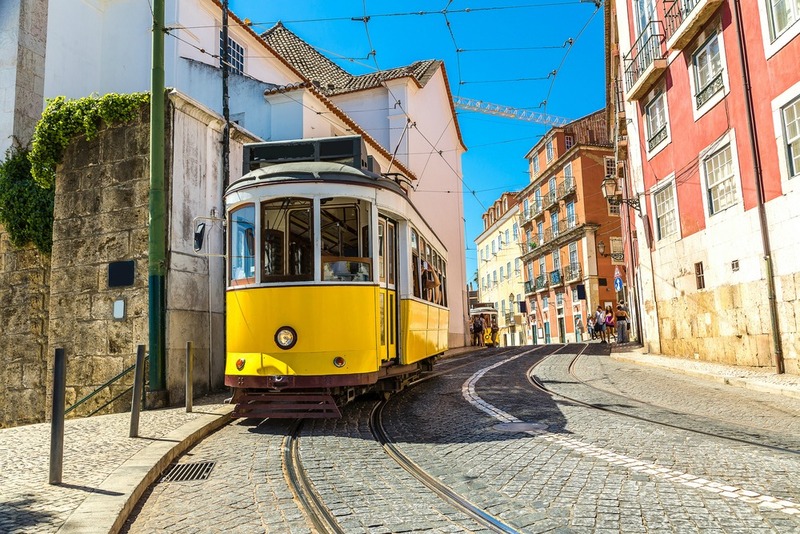 Whether you choose a longer route snaking across the city, or a short and sweet ride from the bottom of a hill to the top, you can’t fail to be enchanted by the vintage interiors of the carts, and the snapshot the ride offers into local Lisbon life. People watching has never been so much fun. A charming town in the Grande Lisboa region, Sintra village lives in the shadow of the Sintra Mountains, which are topped by the romantic and beautiful Palace de Pina, and the ancient and historical Castelo so Mouros. 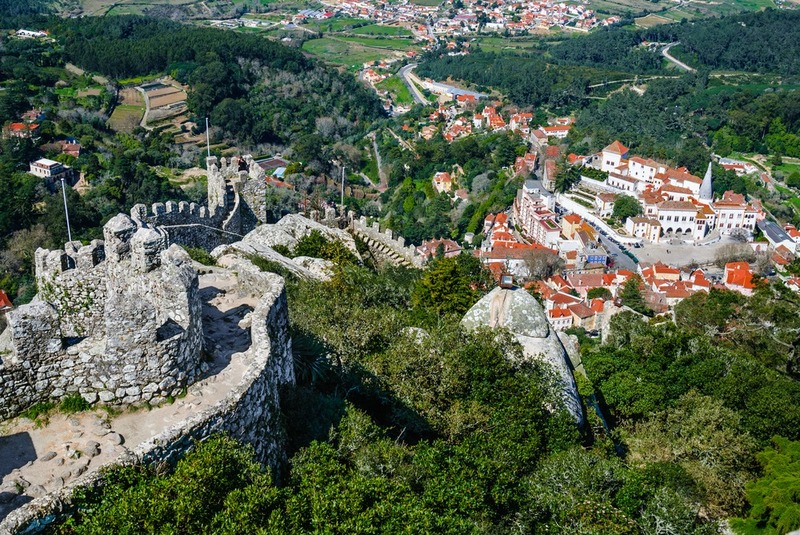 If you’re taking a trip to either of these sites a stop in Sintra is highly recommended. The charming and colourful architecture of the village is enchantingly stylised, with landscaped gardens and narrow winding streets cut into the hillside. 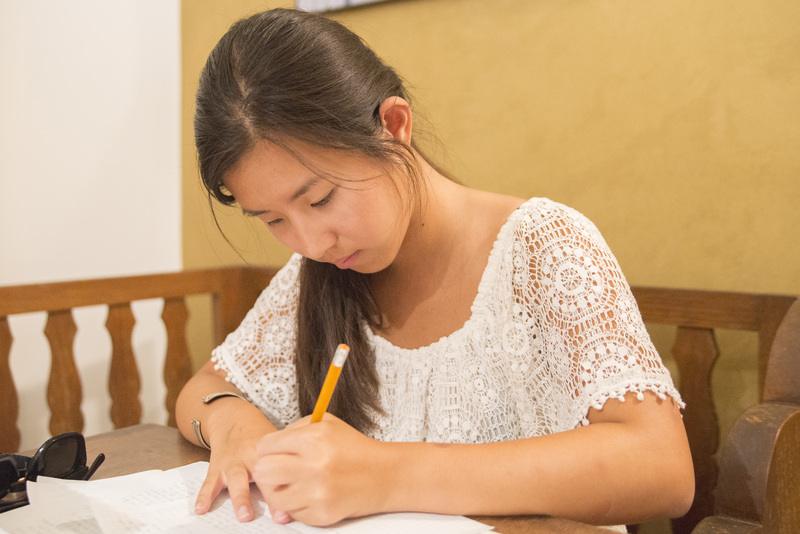 There are plenty of cafes and restaurants serving local dishes, as well as a great array of shops to pick up souvenirs. Lisbon’s “Pink Street” is the go-to destination for a memorable night out. 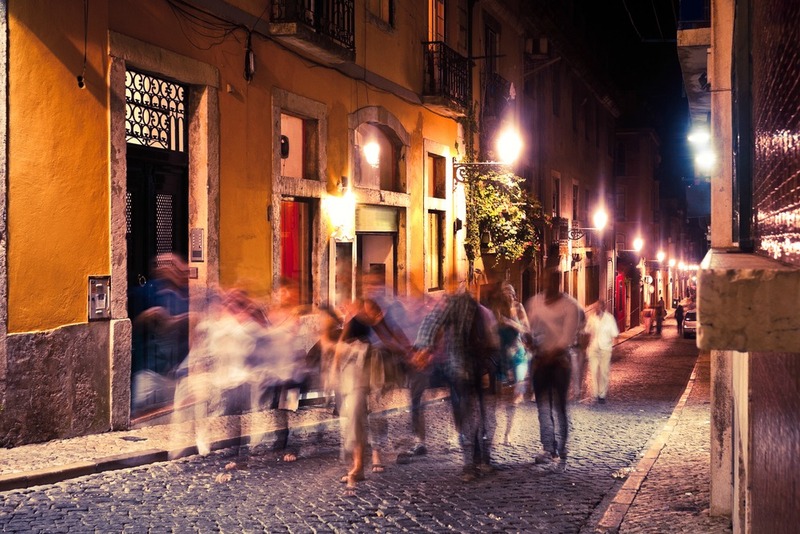 Set in what was historically the red light district of the city, Rua Novado do Carvalho is jam packed with chic bars and cool clubs that stay open until the early hours. The bars spill out into the brightly coloured street, where locals and holidaymakers alike mingle to party. Be sure to check out Pensao Amor, an upstairs bar which boasts an incredible cocktail selection, sumptuous and opulent décor reminiscent of the renaissance period, and a collection of X-rated memorabilia in the bathrooms – a nod to the building’s more sordid past. he stunning architecture. 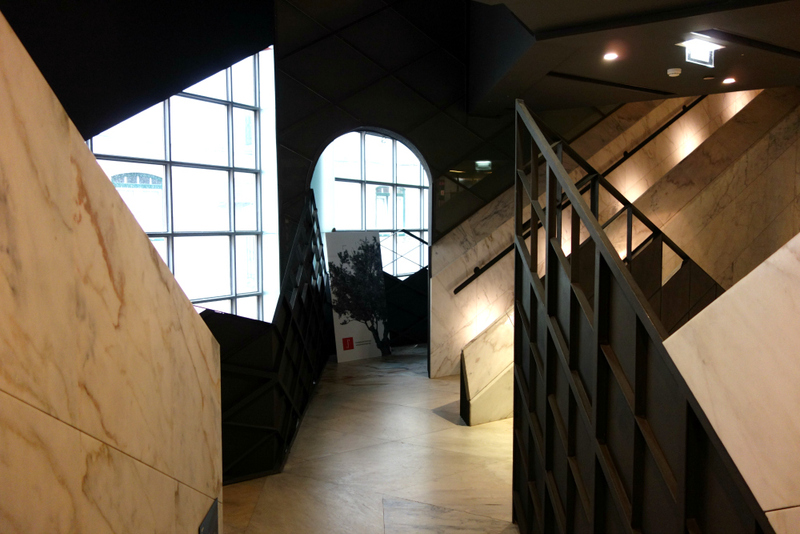 The bold, linear design features criss-crossing staircases, curved archways, exposed stone and polished marble. 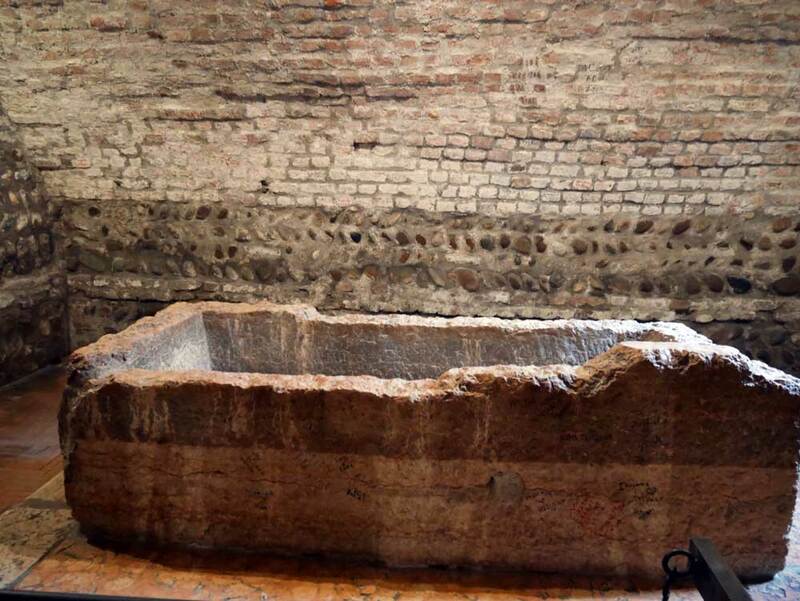 The ground floor of the museum is dedicated to archaeological ruins dating back to the Roman times, which can be viewed from above and juxtapose marvellously with the ultra-modern interior of the museum. 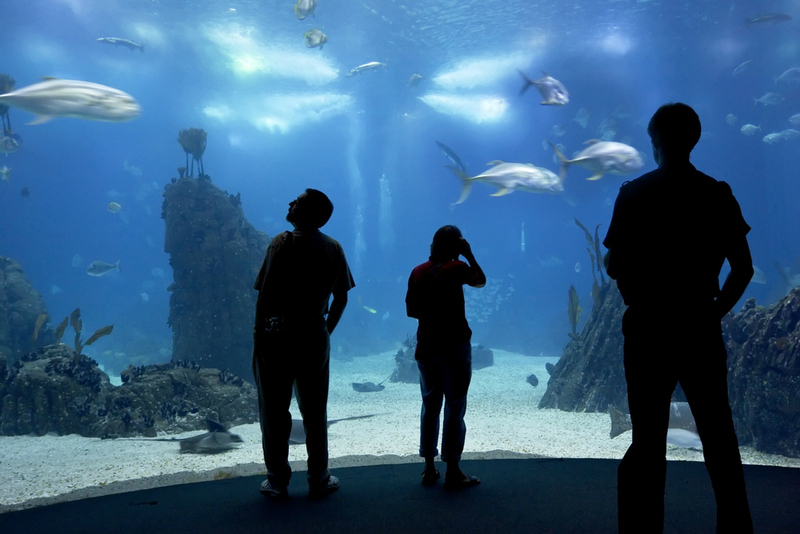 Oceanario de Lisboa features a colossal central tank as its main attraction, which is home to sharks, rays and fish of all shapes and sizes. This huge tank feeds into smaller, more specialised aquariums where you can admire anything from tropical fish to penguins. The range of marine life within the oceanarium is extensive, and there are plenty of unique temporary exhibitions to admire along the journey. On your way through the aquarium you will pass through every area, with plenty of time to learn about jellyfish, crustaceans, sea horses and more. A picturesque district with a more amiable topography than the steep and winding central districts. Belem is home to some of the city’s most famous and historic landmarks, including Mosterio dos Jeronimos, Torre de Belem and Padrao dos Descobrimentos. Admire all of these iconic sights when you take a walk along the sweeping esplanade on the bank of the Tagus River. 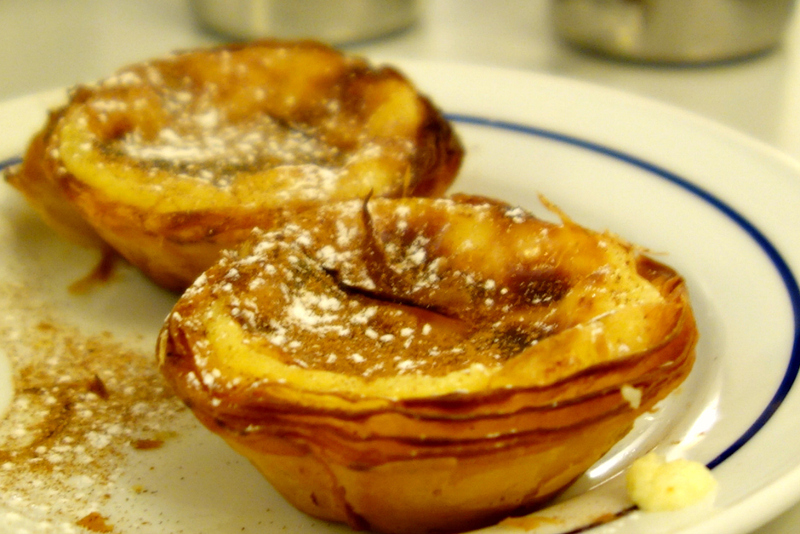 While you’re here sample the local delicacies at Pastis de Belem – Lisbon’s most famed custard tart café. The patisserie churns out thousands of the delicious and delicate pastries every day. Join the queue outside on the street and grab a few to go, or find a seat inside and enjoy yours with a coffee. The medieval castle is set high on the hillside overlooking Lisbon, and provides panoramic views over the old Alfama district. The maze of uncountable terracotta rooftops stretching as far as the eye can see makes it difficult to point out specific landmarks, but it is this aspect of Lisbon’s skyline that makes the city so enchanting – there isn’t a glass skyscraper or modern architectural eyesore in sight. Admire the imposing beauty of the castle structure, explore the different levels, turrets and interior gardens, and relax in the shade of the enormous mature trees.